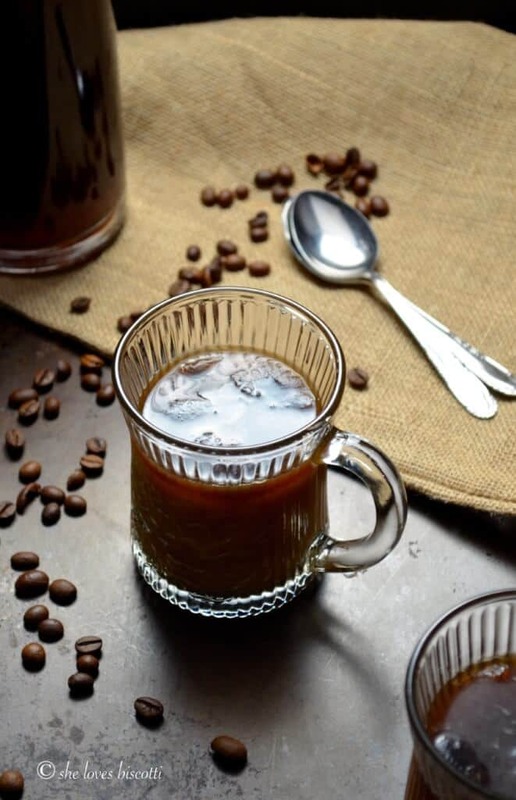 On hot summer days, there’s nothing like this Ice Cold Brewed Espresso Coffee Recipe to perk you up. I’m here to tell you that making your own couldn’t be easier or cheaper. No fancy cold brew equipment, no French press (although if you already have one, great! ), no Starbucks… just a jar, some sort of filter and a couple of good beans. Just add some milk (or water) and a sweetener to this concentrate and you’re good to go! I used to think that making a cold coffee was as simple as brewing an espresso, sweetening it and then adding a couple of ice cubes to make it cold. Now I know better – following this, admittedly simple, method will give you a cold coffee that is diluted and bitter. Why diluted? Well, adding ice cold water (a.k.a. an ice cube) to a hot beverage will do that! So I refined my method a little bit. I thought about making the espresso stronger, and then I even got the genius idea of freezing my leftover regular morning coffee into ice cubes to add, instead of normal ice. My new-and-improved method for cold espresso coffee was indeed no longer diluted, but I personally wasn’t comfortable with how much sweetener I needed to add to remove the bitter taste. When I think of all the family and friends that I offered this drink to… I truly apologize! So, how is this achieved without any fancy equipment? 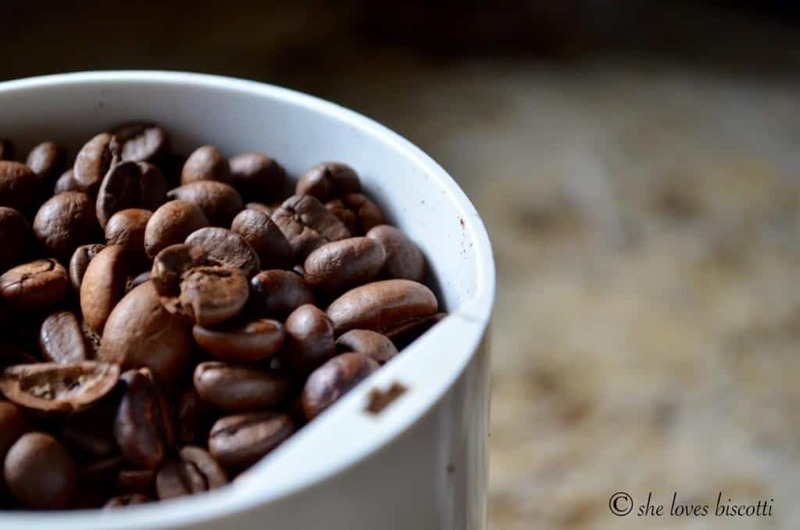 1- Grind your coffee beans to medium-coarse. I have found that a light espresso roast gives a less bitter flavor than the dark roasts. Feel free to experiment and see what works for you. Using a medium-coarse ground will help to achieve a truly clear liquid. Finely ground coffee beans will result in a cloudy liquid. In order to maximize on the taste, combine the freshly ground beans with the water ASAP. 2- Add cold filtered water to the freshly ground beans (regular cold tap water is fine). 3- Stir. Stir. Stir. Every freshly ground coffee bean needs to be completely submersed by the water. 4- Cover your jar (or whatever container you are using). 6- Filter the cold brew coffee concentrate. I will use my regular coffee filter for this. 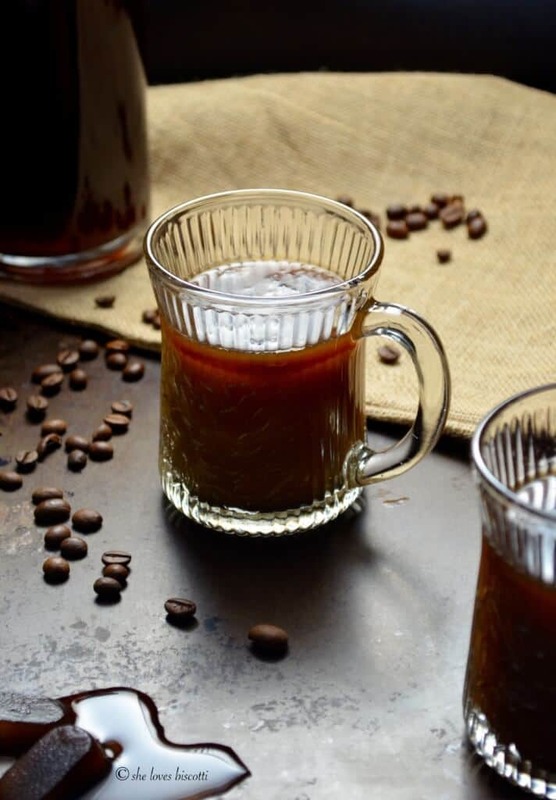 If you don’t have one, you can line a sieve with some cheesecloth…but that can get expensive if you are going to be making a lot of this Ice Cold Brewed Espresso Coffee Recipe. Another great option is a nut milk bag. 7- Adjust your coffee concentrate with milk or water and a sweetener. A couple of years ago, I found this article in my local paper, the Montreal Gazette and this article from the New York Times Food section. Once I tried this recipe, I immediately tasted the difference “cold brewing” made and was hooked. I’ve adjusted the ratio to suit my personal tastes. Needless to say, I’ve been making it ever since. Feel free to adjust the amount of coffee beans to the amount of water to suit your own personal taste. Oh, I almost forgot… if you’ve ever wondered what to do with coffee grounds, here’s an article that you might find interesting. So there you have it, my dear coffee aficionados! 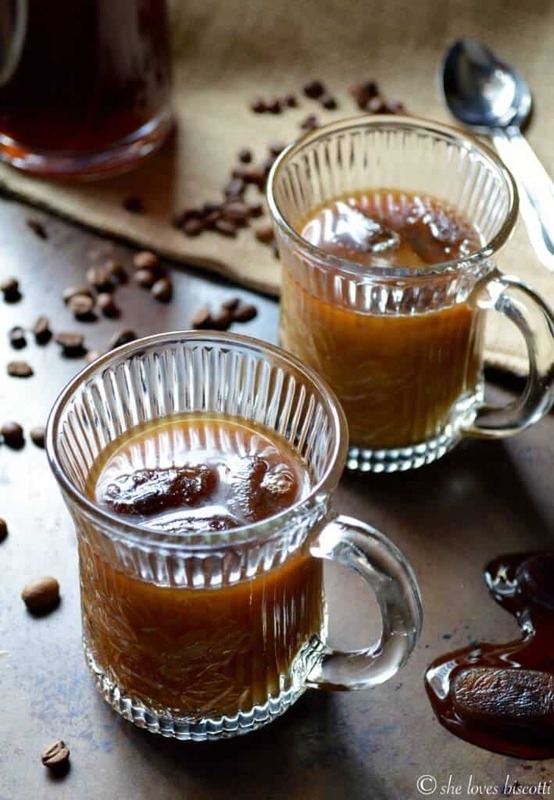 An Ice Cold Brewed Espresso Coffee Recipe to help you beat the summer heat. How do you plan on staying cool this summer? 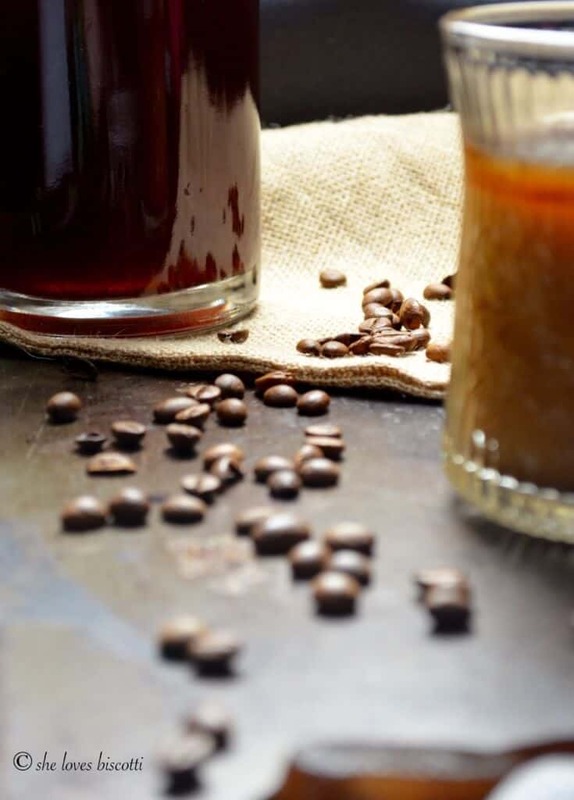 On hot summer days, there's nothing like this Ice Cold Brewed Espresso Coffee Recipe to perk you up -making your own couldn't be easier or cheaper. 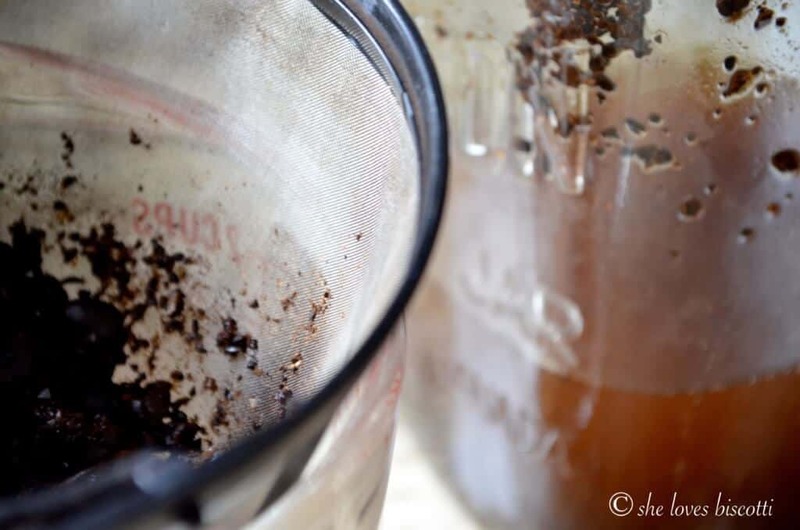 In a mason jar, stir together the ground coffee and the water. Make sure the coffee grounds have been well mixed in the water. Strain with a coffee filter, cheese cloth or nut milk bag. When ready to serve, add equal parts of milk (or water) and coffee concentrate. Can also be sweetened and flavored with different kinds of milk. You can use a French Press if you have one. If making a large batch coffee concentrate can be stored in the refrigerator for up to a week. Recipe will yield about 2 cups of concentrate. I made this brew on Sunday night as I had a huge bag of espresso that a friend gave me. I noticed that you start with 3 cups of water but by the end of the process you end up with 2 nice cups of cold coffee. I’m wondering if for economy sake, it would be best to just make the coffee in a “machinetta” on top of the stove. Nonetheless loved the concept and will share with family cause we all enjoy cold espresso in the summer! Definitely going to give this a try thank you I love iced coffee and have always struggled I sounds like you lol something o would suggest and would be more than worth it for you is a very inexpensive coffee press the one I got was from ikea I think 10 dollars. Thanks again for the iced coffee idea. I made up a brew from your recipes today and it tasted great. Iced coffee mixes are great in these summer months. So simple. Thanks for figuring this out. Love iced coffee and can’t wait to try this. And, I appreciate the link to the use for used coffee grounds. My grandmother used these for all her lush plants. Some times you forget the simple things. Back to basics… like your green goddess egg salad 😉 Thanks for dropping by Deb.